The animal was being studied, along with about 50 other mountain lions in the Santa Monica Mountains, by the National Park Service to determine how they survive in an increasingly urbanized area. Because his death occurred a few weeks after after wildfires burned a good chunk of his home range in the Verdugo Mountains, researchers thought the fires might’ve contributed to his death. But lab work performed by the California Animal Health and Food Safety Laboratory found six different anticoagulant rodenticide compounds in his liver. 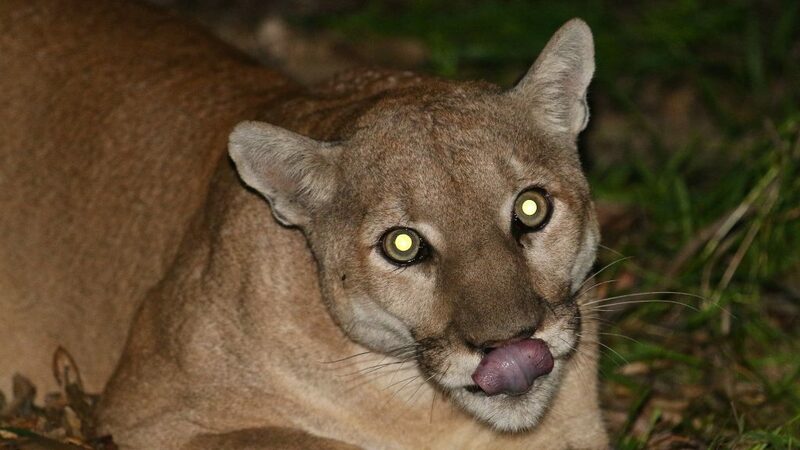 National Park Service researchers found rodenticide in 13 out of 14 other mountain lions they tested recently, and have attributed at least three mountain lion deaths to the the poison. 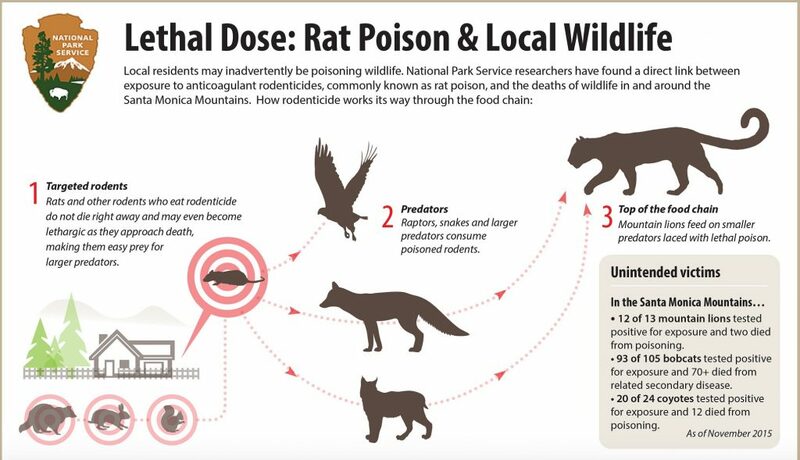 “We continue to see indications that these poisons are working their way up the food chain through what we believe is unintentional poisoning,” said Dr. Seth Riley, wildlife ecologist for the Santa Monica Mountains National Recreation Area. “The long-term survival of mountain lions in this region is threatened by a number of factors, none more significant than the loss and fragmentation of habitat by roads and development,” the National Park Service says on its website. Mountain lions — also known as cougars, panthers and pumas — used to flourish all over North and South America. They are now nearly extinct in the Eastern part of the United States, and are a protected species in California. The Sierra Nevada mountains are one of their few remaining habitats. The mountain lion is regulated under the Convention on International Trade in Endangered Species of Wild Fauna and Flora. I love these beautiful cats and am saddened that they are threatened in the areas where they live and survive because of encroachment into their territory. And even more saddened that they are being unintentionally poisoned. Man has an awful lot to answer for. This Earth is for all life to live peacefully on, equally. This Earth does not belong to us…we belong to the Earth!……..Pam. Pam I agree with you all the way. We do not have the right to destroy or mistreat our native wildlife. All our animals are disappearing at a very fast rate because of our ignorance. without them we are left with nothing but ignorance, pollution, and ill-informed people such as this Nadja Adolf below. I live in Southern California right up against the beautiful Santa Monica Mountains and together with other cities we are fighting ignorance to stop the use of the killing Anticoagulant Rodenticide poisons that are poisoning not only our native wildlife but our pets and families. Never stop believing as there are a lot of good people out there and they will make changes that are good. Good example is Poison Free Malibu. Cougars are NOT endangered in California. Neither are coyotes nor eagles nor most raptors. Please look at the actual data; although in California, data is hard to come by as doing surveys of cougar populations is currently illegal. Cougars have been found stalking school children in places as different as the Central Valley and Palo Alto, a wealthy SF Bay suburb. They routinely walked through a friend’s backyard in the peninsula suburbs, which meant his son could not go out without an adult. See also the state wildlife report on the unendangered and unthreatened cougar of California. If you want to save wildlife, restrict population growth. No pro-natalist programs past the first child, restricted welfare, extremely restrictive immigration, legal or illegal. Development and population growth lead to habitat destruction. Urbanites blame hunters, hunters understand that every subdivision or apartment complex or shopping center destroys habitat – including those “vineyard estates” replacing native grassland pastures. The reality is that a greater risk to native wildlife are the banning of shooting crows – which eat baby native birds and wildlife, the spread of the cowbird, and the ubiquitous house cat and feral cat colonies which have done quite the job on our native ground nesting birds, including rails and quail.